A month ago Google’s Analytics blog announced new social media reports in Google Analytics. Last week they discussed how to use them, and analytics experts have been posting similar articles ever since. If you’re thinking this is the same “Social” report that measured “Engagement” and similar items (under the Audience tab in the new Google Analytics), it is not. This is an entirely new section, located under the Traffic Sources section, and has far more information (and more useful information) than the Social reports in the Audience section. 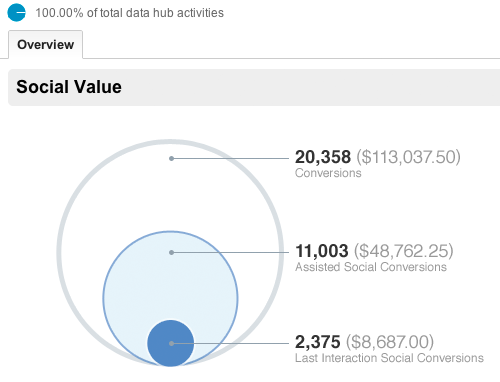 This is fundamentally an effort to use analytics to give monetary value to social referrals. It is similar to the Multi-Channel Funnels analysis in the Conversions report (more on that in a later post), in attempting to go beyond the historic limitation of Google Analytics in giving the “last click” referral source all credit for the conversion. We understand that our guests usually visit more than one site (directory, search engine, review site, social site, etc.) before booking, so this is Google’s attempt to reflect the contribution of multiple sites to a single conversion. What Do Social Visitors Do? The Social Sources report shows you traffic volume by date (in the usual graph at the top of the report), plus each social referrer and the number of referrals. In addition, the small icon of a network (two small circles, connected to a larger circle) is being used to show that the source is part of a Social Data Hub, allowing more information, including actual comments and shares of your content on social networks. The Social Plugins report is designed to show you how many people are clicking your social sharing buttons (your Facebook “Like” button, Google+ share or +1 buttons, Tweet buttons, etc.). Businesses, seeking to determine the value of social media (if any), as well as analytics experts, have been clamoring for a way to measure the impact of social media for several years. While these reports are a big improvement over the previous Audience > Social reports, they are new, and are likely to be tweaked and improved over time. For large sites, especially sites with a lot of social sharing, these reports will be very gratefully received. For smaller sites, with fewer active sharers, the primary value lies in the conversion reports and the referral source reports, rather than the social plugins. We are certainly glad to see these improvements, and strongly suggest that, if you have not set up Goals in your Analytics, that you do so immediately, so you can take advantage of these new social reports. HELP! Using your guide, I was trying to get Webervation on my Facebook page. Problem is, FBML is no longer being used. Once upon a time, I knew some HTML but its been a while. I need to get something up and running quickly. I managed to post a link but I don’t know that it will solve the issue. Any ideas would be greatly appreciated! You’re right of course! It’s time (past time, actually) to update the instructions without using FBML. Look for that in an upcoming post.